Vivaldi’s “Spring” concerto from The Four Seasons, performed by Nigel Kennedy and the English Chamber Orchestra, cuts in as the film flashes back again to Berlin in 1977. Muir is in black tie with a glass of single malt in his hand, accompanying his “cousin” (Andrea Osvárt) to a party where the two encounter the enigmatic Ms. Cathcart. Muir: Am I supposed to feel bad about that? While Tom Bishop is out with an East German informant speeding through the back streets of Berlin in his beaten-up Škoda, Muir is hobnobbing with the elite of the spying community at a black tie gathering that would’ve surely made 007 salivate. His black wool dinner jacket has satin-faced peak lapels that are fashionably wide for the late ’70s and roll to the single-button closure. Both the single front button and the three buttons on each cuff are covered in black silk. Muir, his “cousin”, and Anne Cathcart. Muir completes his tuxedo with a pair of black wool formal trousers with a satin stripe on the side of each leg and plain-hemmed bottoms. A pleated black silk cummerbund covers his waist. 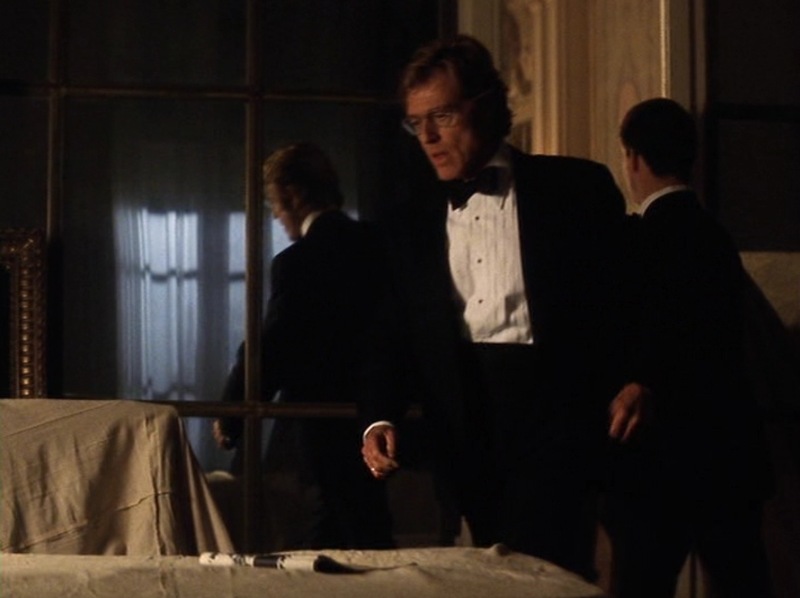 Robert Redford is a frequent customer of Anto Beverly Hills, so it was Anto that provided his tuxedo shirt in Spy Game. The white formal shirt is Swiss cotton with a long point collar and five 3/4″ pleats on each side of the front placket. The small, gold-trimmed black shirt studs match the larger rounded square cuff links in each of the shirt’s double (French) cuffs. Underneath, Muir wears a white cotton crew-neck short-sleeved t-shirt as an undershirt. Muir also wears a black satin bow tie, self-tied with a butterfly shape. Muir ventures out onto a Berlin rooftop early that morning for a covert meeting with Bishop following the failed extraction of Schmidt and the successful unveiling of Cathcart the mole. To combat the morning chill, Muir dons a black wool car coat with styling details borrowed from a traditional pea coat like the wide Ulster collar, hand pockets, and double-breasted front (consisting of six widely-spaced buttons, with three to button). The coat has roped sleeveheads and a short fit that ends at his hips. 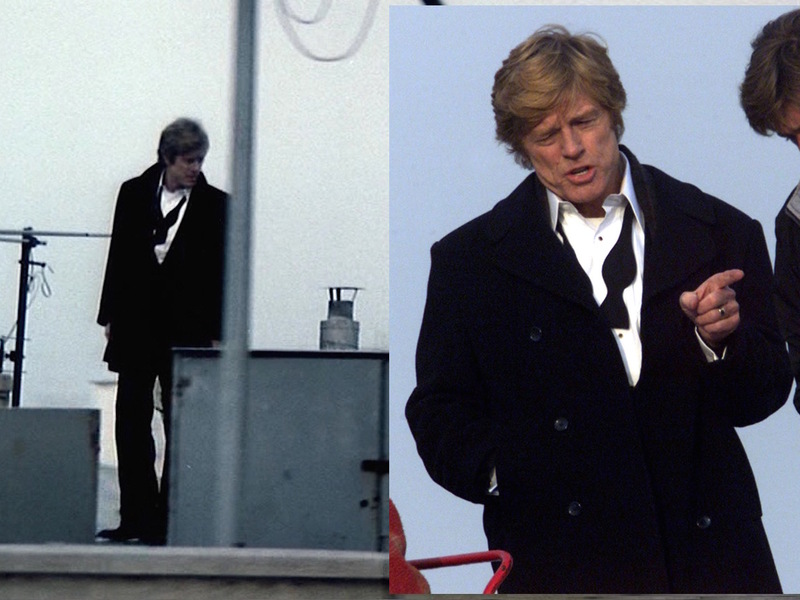 The rooftop scenes also reveal Muir’s footwear with his black tie ensemble. He wears black patent leather oxfords, the most formal shoe option after the opera pump, and black dress socks. 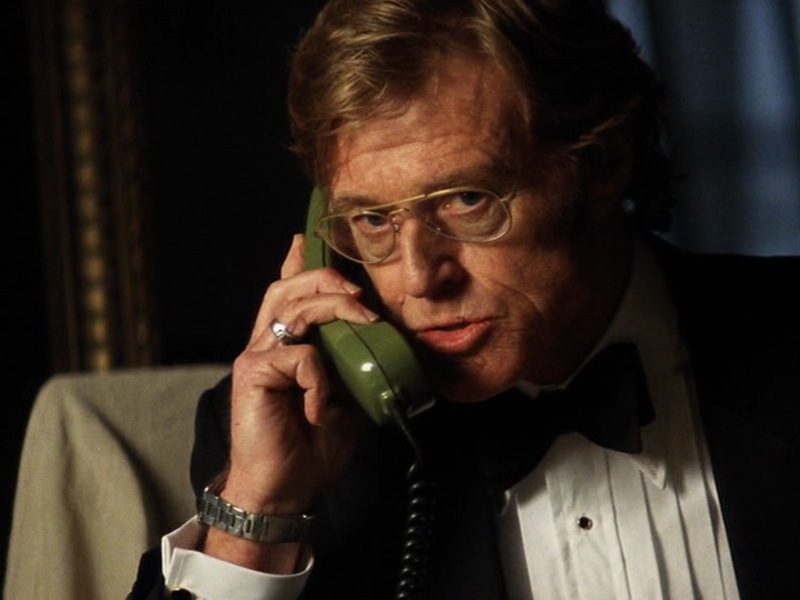 Muir wears the same accessories on his right hand as he does throughout Spy Game. His stainless steel wristwatch is a Victorinox Swiss Army Officer’s 1884 watch with a white dial on a stainless link bracelet. 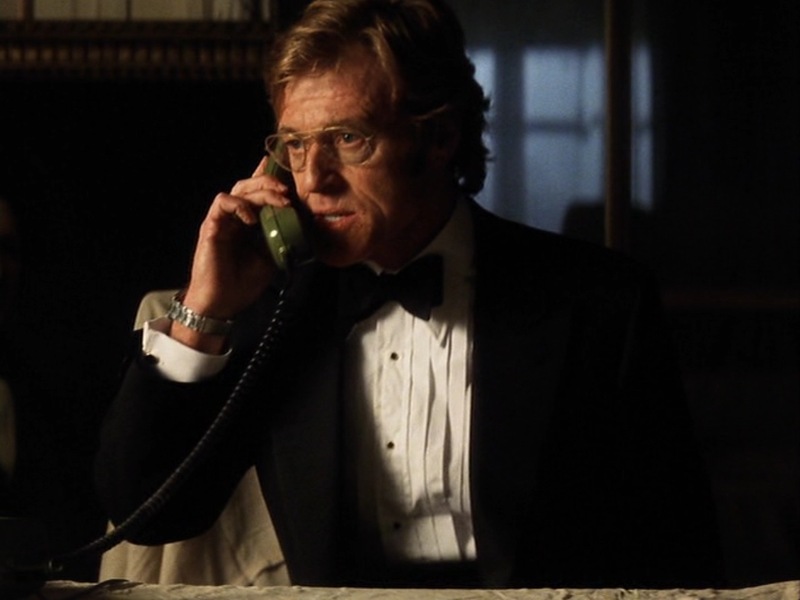 The ring on his third finger is the silver ring that Robert Redford received as a gift from Hopi Indians in 1966 and wears in most of his films. He also appears to have a gold wedding ring on his left hand. Muir isn’t used to orders not being obeyed. 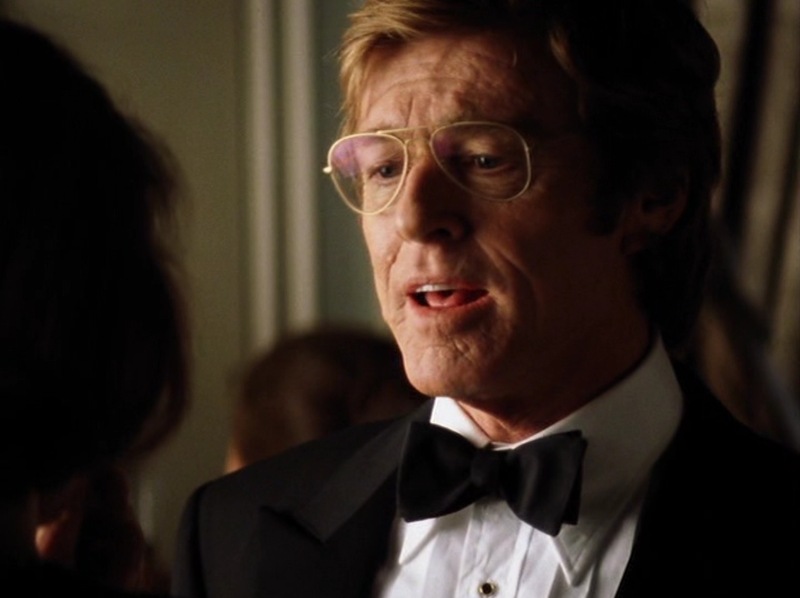 The gold-framed aviator-style eyeglasses that Muir wears are consistent with his specs seen in most of the film’s 1970s-set scenes; after that, he switches to a pair of Oliver Peoples glasses. Nathan Muir fashionably incorporates 1970s trends into an ultimately timeless tuxedo for a night of espionage and intrigue. 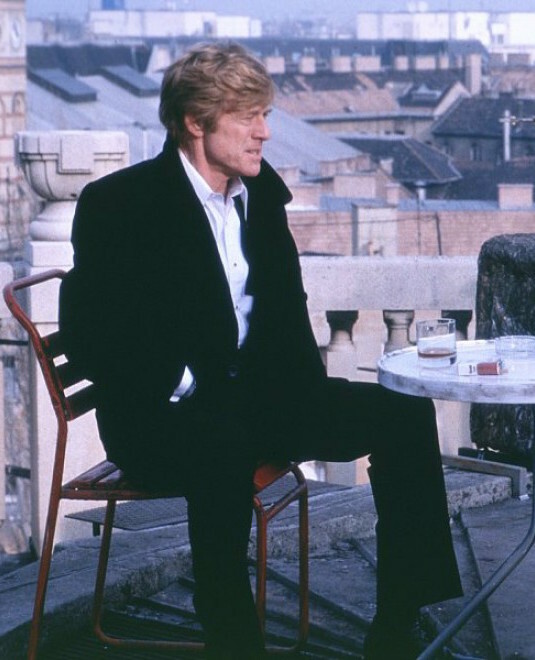 Andrea Osvárt and Robert Redford. It’s no kid’s game, either, but a whole other game… and it’s serious, and it’s dangerous, and it’s not one you want to lose.